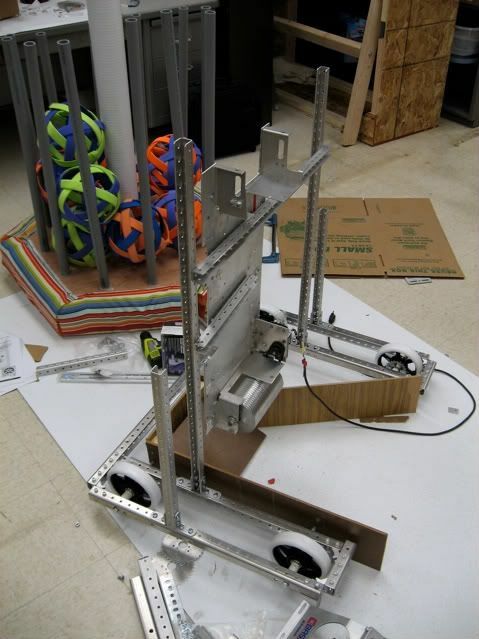 We spent some time last night working more on the chassis to figure out the layout of the ball pickup, motors, electronics and so on. We're getting closer. The ball pickup seems promising. The students did a great job on everything and had lots of smart ideas. We're still trying to arrive at a final design and hopefully will get there soon. We have a tendency to make big changes from session to session because we can't all attend every session and because we have some communication challenges that makes it difficult to maintain continuity of design across build sessions. Hopefully the team will work something out tonight and Saturday. I am indisposed until Sunday, and am being called away to Orlando by work next week. So my contributions will be pretty limited for awhile. I think the pressure will start to get pretty high by the time I get back.